The rain-smeared lights dripped along the dark glass, the reds and greens, blues and yellows running, Annie thought, like angels’ tears; beyond, in the street a few cars huffed at the stop light and then burst away, swallowed by the darkness. Annie shook her head and shifted the small Christmas tree to the center of the window display and settled the wrapped boxes at the base. Tomorrow the shelter families would come for their annual party. It always broke her heart to see the little ones. They would smile when they pulled off the wrapping to find a small bear or doll, a little train set, but the sadness would never really leave their eyes, she knew. They would stroke the arms of their new coat, wiggle their fingers in new gloves and hold out their legs stiffly to admire a new pair of boots. But Annie knew they would wake tomorrow in the home that was not a home, and it saddened her that she could not do more about that; there is hope in a place to call your own, she thought. She swept the floor, and with a cup of tea, sat at one of the back tables to rest a moment before hanging the last decorations and lights. It was her first Christmas away from home. A new job, a new city, the pieces of her life coming together. That was why she volunteered at the community center. It reminded her of home, when her family would spend the days before the holiday collecting clothing and toys for the church program. But this was different, the jokes and choral voices a little hollow, swallowed in the grinding of the city sounds; nothing seemed the same. Even listening to a church choir harmonize the familiar carols was not soothing. Homesickness, she decided. It will pass. She closed her eyes a moment, seeking solace, seeking a spot where the worry could not enter. She saw his face in the dark glass, dismissing it as a shadow. But then as she concentrated she could see his eyes below the wool cap, the mouth open behind a dark beard. The room was partly filled with those who had come in for supper. She smiled and waved one hand for him to come inside, but he didn’t move, so she walked to the door. “Please come in,” she offered. She sat him at a table and brought a cup of coffee. He cupped the mug in two hands and closed his eyes while he inhaled the aroma and the steam tickled his nose. “How long have you been out?” Annie asked as she collected his thick but torn winter coat, a scarf, a bulky knit sweater and two pairs of thin gloves. He nodded a silent thanks when Annie brought him a bowl of beef stew and three buttered rolls. She refreshed her tea, and sat opposite him. She watched as he wiped the inside of the bowl with a roll, ate it, and then glanced up at her with a crinkled smile. Annie looked away and then back at him. “No one,” she said, her voice grabbing, and she covered her lie with a drink of tea. She huffed a small laugh and placed the cup on the table. Discovered she was, and it lightened her soul. “I don’t know. It should have happened, but it didn’t, and I left. Came here. New place, new friends, old ache.” She stared into his dark, ancient eyes and cast out a sad smile. Annie stared into the street and tried to conjure the boy’s face, but only watched the light trickle with the rain. “How many is your heart keeping?” she asked. He finished his coffee and leaned his elbows on the table. “Just one. She gave me this,” and he reached for his overcoat. He fumbled in the pocket for a moment and pulled out a wad of white paper and placed in the middle of the table. It was tissue paper, the kind used to wrap Christmas gifts before they were placed in a box. He slowly pulled at the ends of the sheets of paper, and flattened them on the table, like peeling away some precious covering. 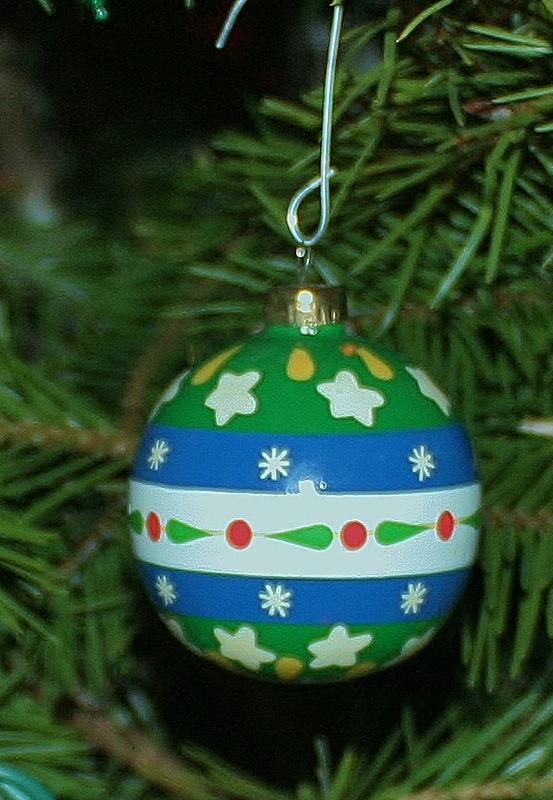 At the center was a glass Christmas ornament, a green ball with streaks of silver glitter clinging in places. A little tin clasp filled the hole at the top of the ball. The color had faded, rubbed off with handling. He picked it up and held it gently in his fingers, admiring it like the most meaningful thing in his life. He slowly wrapped up the ball and then pushed it toward Annie. Annie sat silently as he climbed back into his sweaters and coats, nodded, and left the building. She picked up the green glass ball and hung it on a branch. She stepped into the street and looked into the slight rain in both directions. He had disappeared. In the window the tree with the green glass ball shimmered in the rivulets of rain drops. He was right. She felt blessed.